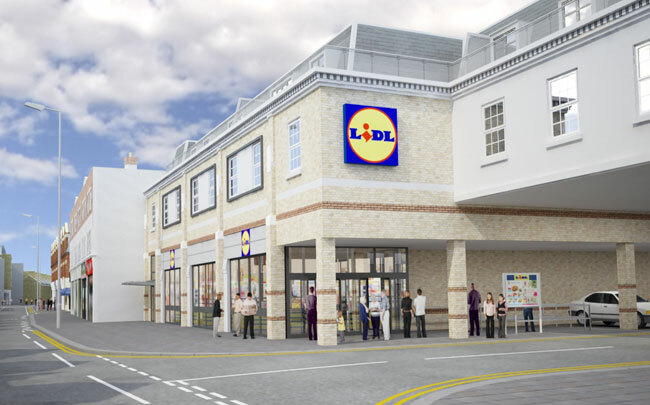 Lidl have submitted another big-box shop plan. This time at Fraser Road in Erith on a site around 10 minutes walk to Erith station. Topps Tiles, Screwfix and other stores currently occupy the site. These will all be demolished. The location could be a great spot to build a true mixed-use development with housing above a new Lidl store. Instead Lidl are going for their usual big shed and car park. 111 car parking spaces will be provided. Bexley Council are in a pickle due to blocking large scale housing developments in many areas for years. It’s cost them much income, and now they are also under pressure from both Labour Mayor Sadiq Khan and the Conservative Government to increase home numbers quickly. As such the have adopted their growth strategy and agreed to sell off greenery. It’s utterly crazy to allow local parks to be built over whilst not pushing for homes on brownfield land such as this. A new Lidl store would still arrive offering local choice and new jobs but also provide new homes. Either they come on sites like this or on greenery. Other authorities have pushed back on Lidl taking the easy option and succeeded. Given Bexley Council’s current predicament it’ll be interesting to see what they do here. The planning reference is 18/00673/FULM. Click here to search. Is there a planning reference code for this? I’d like to get on to Bexley Council and Teresa Pearce about this, it seems like an egregious waste of land. In a time of housing shortage new homes on brownfield near a station is a no brainer. Lidl should be told to go away and come back with mixed use. Urban sprawl is the other option to building in cities and that is overwhelming roads and rail as people head back into London. Hi there,, I am the local franchisee for a lot of the areas you cover. I thoroughly enjoy reading your blogs. They are very informative and you must go to a lot of trouble in putting them together. I would welcome to meet you in person and show you around our sites and perhaps work together. We do a lot of local community work that I would like to share. I think Lidi should go for a mixed use retail/residential development like there store along Lee High Road. It works well in other areas. Not only do you get much needed local housing/ Lidl benefit from customers from the flats above.